The Program Increment (PI) Planning ceremony, the “heartbeat of SAFe” is made simpler and easier using Metronome with powerful yet very intuitive features like the Program Kanban, Program Board and Risk Matrix. PI Planning logistics seem overwhelming to experienced agile experts, let alone people just getting started on SAFe. Metronome includes features to ease the PI planning process, such as setting the Business and Actual Value for the PI Objectives, a Program Board which displays the story and feature dependencies, and a Cumulative Flow Diagram (CFD) which streamlines your PI Planning effort. Metronome also helps organizations overcome some of the challenges that are inherent in Distributed PI Planning sessions. Our experience has been that customers/organizations find it ideal to have the Program Board captured in piplanning app, such as that supplied by Rentouch and Metronome, so it can be shared with remote participants. To address the portability and other challenges in maintaining the Program Board during PI Execution, organizations will find Metronome extremely helpful, as it enables teams to track their progress in ceremonies like the Daily Stand Up. 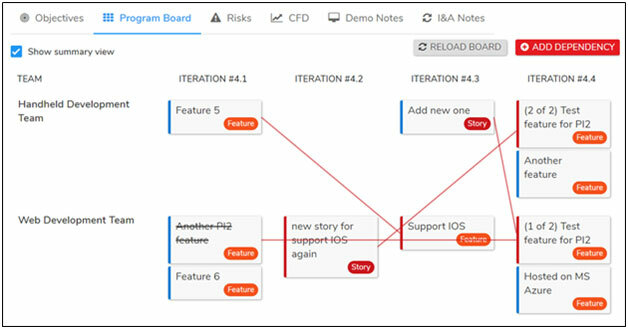 Updates made to the Team’s stories on the Storyboard in Metronome will automatically update the associated features in the Program Board.